Over 4 million happy clients (and well-fed birds) confirm that the patented Squirrel Buster™ system is truly squirrel proof! 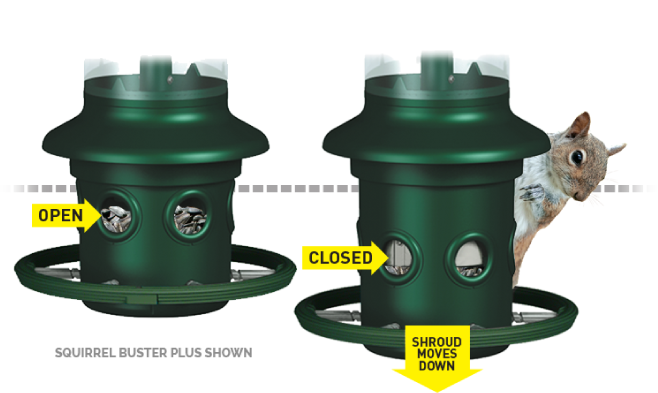 Openings in the outside section of the feeder (shroud) align with seed ports, providing birds access to the seed. When a squirrel climbs onto the feeder, its weight automatically forces the shroud down, closing the seed ports. Squirrels are foiled, and not harmed in any way. 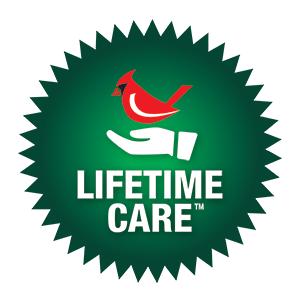 Brome Bird Care, located in Knowlton, Quebec, Canada, is home to the Squirrel Buster™ brand of squirrel proof bird feeders. Led by its founder, Paul Cote, and supported by an impressive list of patents, Squirrel Buster feeders have come to be recognized as the leaders in the squirrel proof category. Find a store near you! Use your address or current location to find the nearest store carrying our products. Not only is the Squirrel Buster a quality and well-designed product, but the no-questions replacement policy can't be beat! I emailed Brome seeking a replacement top unit, expecting them to reply with the cost of a new piece. To my complete surprise, there was no reply until I received the top in the mail. In these modern times, finding a company that stands behind its product with such conviction is rare, and a beautiful thing. Thanks, Brome! You have earned my loyalty for life!